The definitive “How-To” kit on saving taxpayer dollars and insurance premiums by putting criminal psychiatrists out of business or behind bars. 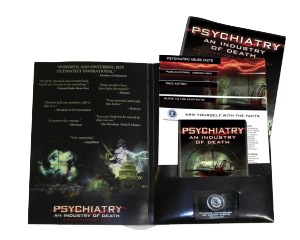 Includes both the Psychiatry: An Industry of Death documentary DVD and brochure supplement, instructions for their effective use, plus additional hard-hitting fact sheets on psychiatry’s fraud, criminality and abuse. This package enables anyone to go straight for psychiatry’s jugular—their money flows.